In this week's edition of #StopAskingForPermission, we highlight the work of the Hip Hop Caucus. Led by Reverend Lennox Yearwood Jr., this organization's grassroots level approach to community organizing is eliminating our excuse for not getting involved. Community organizing is at the heart of local elections. It's all about gathering people together who have a similar interest to advance a particular cause. As easy as it may sound, it's harder in practice. Community organizing groups have come and gone over the years as people quickly burn out from the hard work it takes to keep people inspired and promote hope to those who have lost it. Not only is community organizing a vital part of local elections it's the same important part of the process for national elections. We have seen candidates from both parties engage in conversations with communities that center around issues like race, gender, education, and various other important topics. 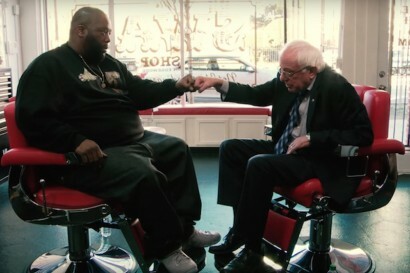 For example, Bernie Sanders went as far as to have barbershop stops and prayer meetings on his campaign trail to get the black voters on his side. Photo: Salon The Hip Hop Caucus, a national non-profit, non-partisan organization was created in 2004. It was the brain child of four organizations that decided to merge together. Those four organizations were: Russell Simmons' Hip Hop Summit, P.Diddy's Citizen Change (aka Vote or Die), Jay -Z Voice Your Choice, and AFL-CIO Hip Hop Voices. The premise of the organizations was to connect the Hip Hop community to the civic processes that build power and create positive change. For over a decade they have launched several programs like People's Climate Music, a campaign for climate change and environmental justice. They have also launched Supreme Justice which is a campaign that helps to inform and empower the community to speak up and have their voices heard from the streets to Capitol Hill. After the death of Supreme Court Justice Antonin Scalia this campaign has pushed to organize events and actions to create urgency to fill his seat. One of the more popular campaigns, which has Charlamagne Tha God as its spokesperson, is Respect My Vote. This campaign is focused on strengthening democracy by registering, educating and mobilizing voters. The Caucus also fights against attacks on voting rights as well as fight for election system reforms that make voting easier for Americans. 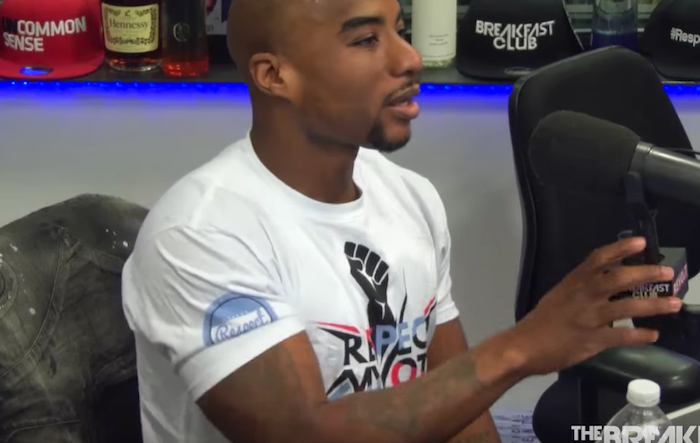 Photo: youtube By now we all have watched the infamous Birdman interview on the Breakfast Club, and if you pay attention, you'll see Charlamagne wearing the Respect My Vote shirt. The Respect My Vote snapback, in addition to the matching tee, supports the campaign with its proceeds going towards helping ex-offenders register to vote. States across the country are changing the way they allow ex-offenders to participate in the democratic process, and most recently Virginia and Maryland have made it possible for them to vote. It's important to remember that former spokespersons T.I., 2 Chainz, and Charlamagne are all convicted felons. If we can support their music and radio show, we can support their push to get us to vote. We always ask our audience to stop asking for permission to get involved in local politics, but here's your chance to simply make a change by buying a shirt or joining a campaign. Whether it's respecting my vote, climate change, or helping push for the next Supreme Court Justice, the Hip Hop Caucus has eliminated your excuse for waiting for permission. As they say, "Take part and have a seat." And as we say over here at Blavity #StopAskingForPermission.